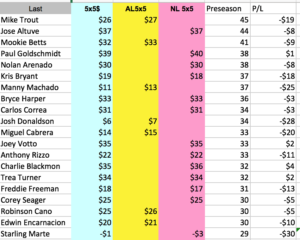 Patton $ Cheat Sheets are here in time for your Fantasy Baseball Auction/Draft! That means now! 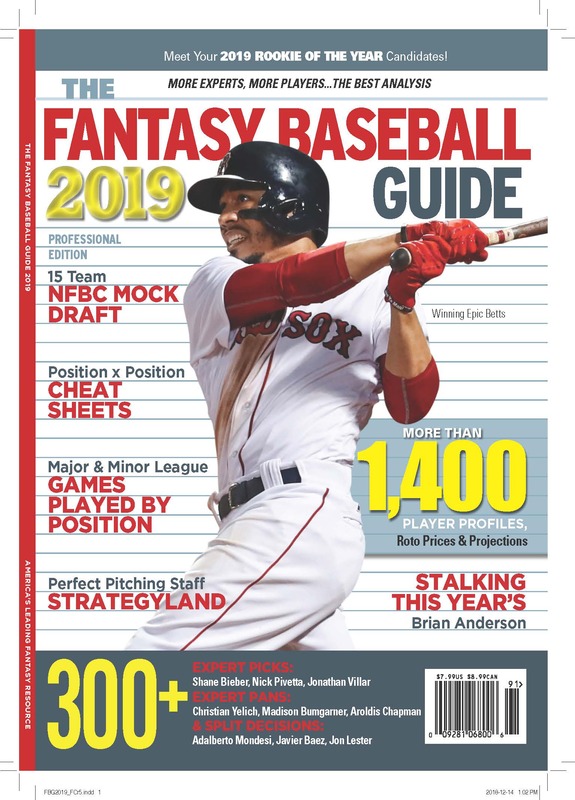 Is your fantasy baseball draft coming up? Are you not ready? Or would you like to see what lists Alex Patton and Rotoman (FSWA Hall of Famers) are using this year? No matter what you need, they are here to help. We’ve extracted all the ranked position charts from the PattonandCo.com annual subscriber package (which we’ve been selling for 20 years and you can buy here) and made Fantasy Baseball Cheat Sheets based on Alex’s 4×4 and Rotoman’s 5×5 lists for AL, NL and Mixed leagues. These lists are great for reviewing your own opinions, or as the basis for your auction/draft itself. These are the Cheat Sheets Alex and Rotoman will be taking to their own AL and NL only auctions this week and next. Interested? You can read more and buy by clicking here. There isn’t time. There are more than 300 of these comments in the Guide in any given year, and to do a fair evaluation each has to be looked at closely. Many Picks suggest modest gains for very marginal players, and many Pans concede good but not great performance for stars. Two comments, one pick and one pan, can predict the same things. It would be a little rude. I ask a lot of smart fantasy baseball people to participate in the fun of the Picks and Pans. When we first pick up the Guide after its January release, it’s hard to resist the lure of who’s picking/panning who. “Rick Porcello, 11 Pans! Incredible!” We all get some right, and some wrong, but the fun comes from the jokes, the word play, the odd stats, that crop up in the comments. I’m afraid putting them up on a scoreboard, from which reputation could be inferred immediately would spoil things. Everyone would be obligated to be more exacting, less free wheeling, or possibly suffer for it. That’s no fun! 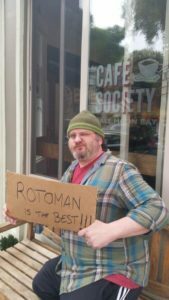 But Don Drooker, the Rotisserie Duck (not a la orange), grades his own picks at his excellent blog, rotisserieduck.com. Maybe because they’re so good, or so much fun. This is something I endorse. Reading his comments and then his explanation of why he graded the P+Ps as he did is almost as informative as reading the original predictions. The bottom line in fantasy baseball is where are you in the standings. Absolutely. But the bottom line is a moving target as the season goes along. The top performers in the first half don’t usually perform as well in the second half, and some folks we’ve left for dead in the first half reemerge in the second half full of life. All of which aligns with what we know about regression to the mean. If you’re the best (or worst) at something for a little while, you’re likely to do worse (or better) for the next little while. You can see the first half fantasy profit/loss spreadsheet here. Use this information to help target players for the second half. Of course, everyone wants to know who is killing their team, as if they didn’t already know. No. 11 is Jason Verlander, BTW. 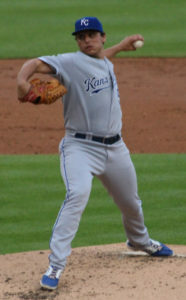 You have to decide whether to bail on bad first halfs by historically good pitchers. I would bet on a better second half for Tanaka and Verlander, and worry more about Tillman and Glasnow. But Tillman and Glasnow are talented, and history says that if they stay healthy they will have their moments. 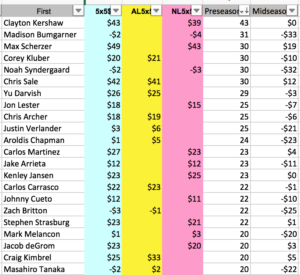 Yesterday I posted lists of the Top 20 hitters and pitchers in 2017, sorted by the Most Costly (with 2017 earnings), and the Most Earned (with 2017 prices). Today I’m dumping the whole spreadsheets, sorted right now by Biggest Profit to Biggest Loss. That’s enough, right? These are guys someone paid real money for, and the results have not been good. If you want the whole hitter list, download it here. Looking at hitters the other way, from the top of the list of big earners, is a very reciprocal view than looking at them ranked by preseason expectations. In fact, the Top 20 big earners so far cost $491, the exact same amount the Top 20 most costly hitters earned. That’s weird. 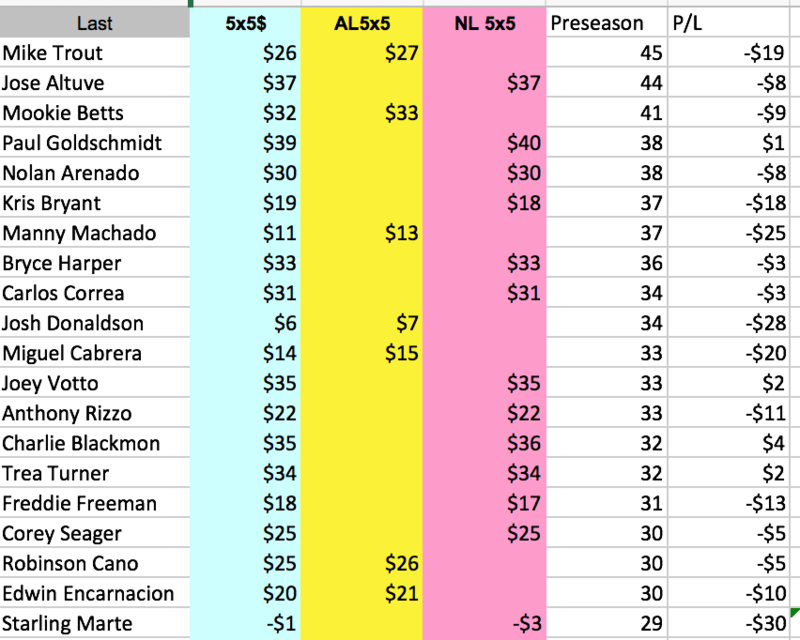 And the Top 20 big earners have earned $665, just $30 less than the Top 20 most costly hitters cost! None of the Top 20 big earners went for free on auction day, but Aaron Judge, Ryan Zimmerman and Corey Dickerson went for single digits and are earning big profits. Hitters are generally considered more reliable than pitchers, in large part because they do not get hurt as catastrophically as do hurlers. 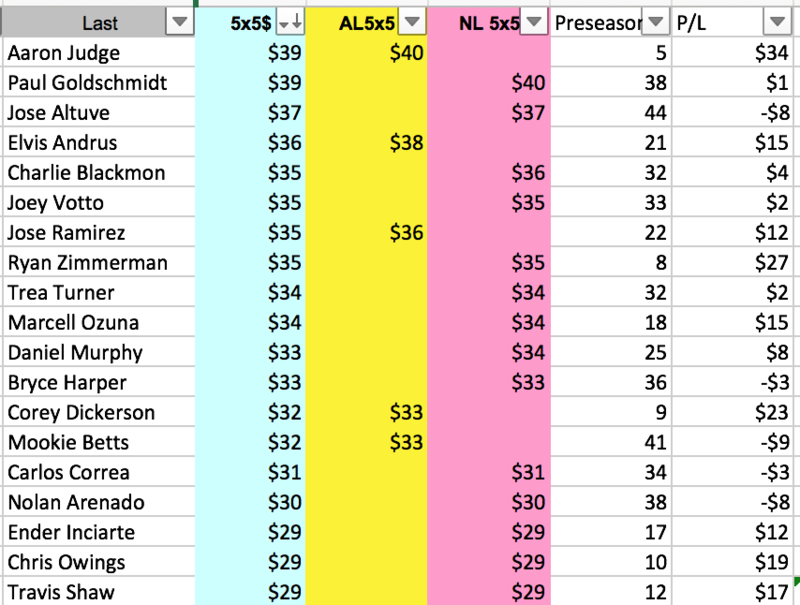 But a look at the Top 20 hitters ranked by auction day 5×5 price shows disasters for owners of Mike Trout, Josh Donaldson, Freddie Freeman and Starling Marte. 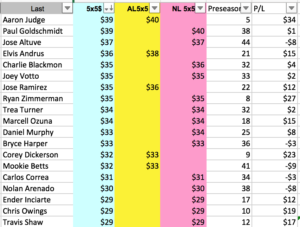 Still, the Top 20 hitters cost $695 and earned $491, a better ratio than the Top 20 pitchers. A closer look at the list shows that most of the attrition is due to injury, and a slight overvaluing of the best players, who also happen to put up big stats even when they’re not having a great season. Another way to look at the pitching pool is to see what the top earners are earning, and just how much they cost on auction day. The ratio of cost to earnings in this group reverses. The Top 20 players cost $313 and earn $596. 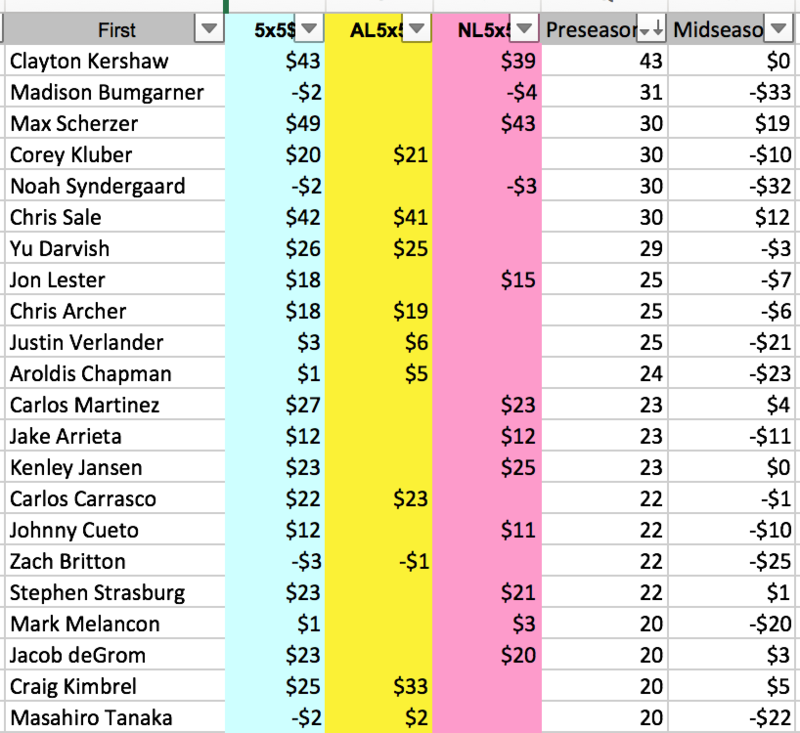 The biggest earner, Max Scherzer, was the third most costly pitcher, while Clayton Kershaw, also on this list was the most costly by a lot, but the big differences are the guys nobody expected so see here. Jason Vargas, Ervin Santana, Alex Wood, Ivan Nova!?!?!? No bigger surprise comes in at No. 20 on the list, Chase Anderson, who was not even bought by the experts on draft day. 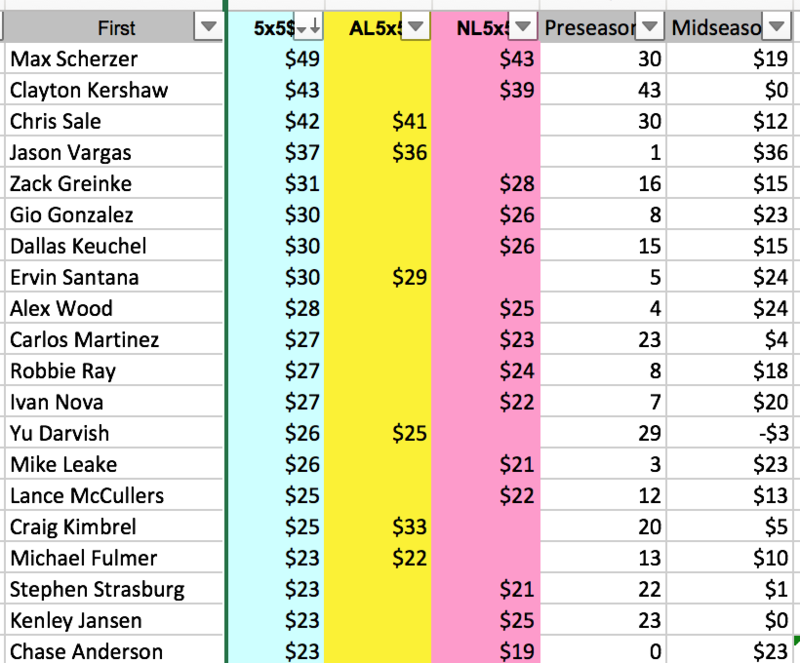 Through June second, the Top 20 most expensive pitchers are a mixed bag. Some, like Max Scherzer, shook off preseason injury worries, and is dominating right now, the best pitcher in either league in the first half. 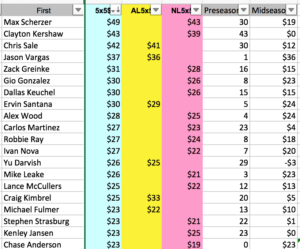 Some, like Clayton Kershaw, who was bid up to $43 in the expert leagues because of his dominance and reliability, has reliably earned exactly that in the first half of play this year. So there. But overall, this top group cost $521 in salary in the preseason and has thus far earned only $357, thanks to injuries and busts. Madison Bumgarner was the second priciest pitcher on auction day, and was effective in the few starts he made before he was shut down with a sprained shoulder following a dirt bike accident in mid April. Ouch! Here’s a look at the Top 20 highest paid pitchers this year, and how they’re faring. You can click for a larger view. Standup guy Howard Bender sitting down in Half Moon Bay. Everybody’s buddy and fine fantasy baseball analyst, Howard Bender, had a piece in the NY Post this week warning about overestimating Turner this year, the way Carlos Correa was overestimated last year. That’s good advice in general, and probably as it applies to Turner, but it raises the question of how do you draw the line on a young player with a spectacularly good partial season under his belt. I looked at hitters who had an OPS+ of 130 or better in the year they lost their rookie status since 1980 (the Roto Era), who had 249 plate appearances or more. Sixty one hitters qualified. Five of those seasons came in 2016. That would be Corey Seager, Aledmys Diaz, Trea Turner, and the Ryans Shrimpf and Healy. One player, Kyle Schwarber, had a qualifying first season and didn’t play the next. That leaves us with 55 hitters in the pool. The top 11 had an an OPS+ of 157 in year 1 and an OPS+ of 137 in year 2. Two of this group improved in year two, a man named Trout and another named Greenwell. Three had less than a 130 OPS in year 2: Luke Scott, posterboy Kevin Maas, and Miguel Sano. This group averaged 499 plate appearances. The next 11 averaged 143 in year 1, and 109 in year 2. 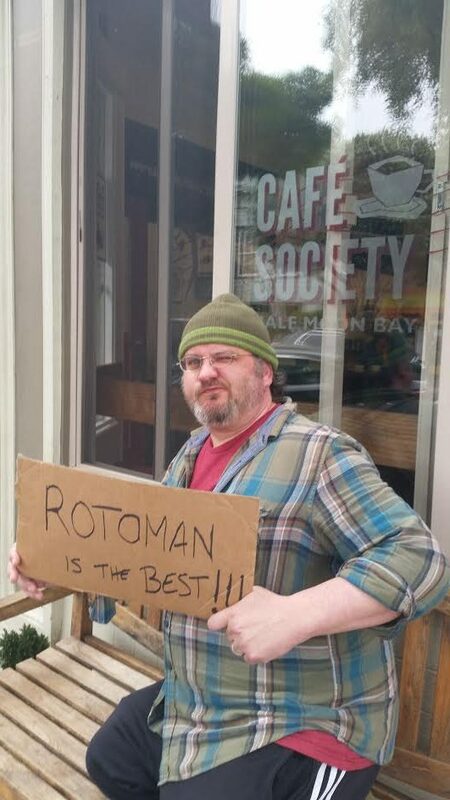 One of this cohort, Randy Milligan, improved. Seven had less than a 130 OPS+. Five has less than a 100 OPS+. This group averaged 442 plate appearances. The middle 11 averaged 137 in year 1, and 116 in year 2. Kris Bryant was the only one to improve. Two were better than 130 in year 2. Only two had less than a 100 OPS+, both at 99, which is why the year 2 average went up for this group. This group averaged 349 plate appearances. The fourth 11 average 133 in year 1, and 120 in year 2. Ryan Howard and Jason Bay improved. They were also the only two to have an OPS+ the next year better than 130. None of this group has an OPS+ of less than 100. This group averaged 416 plate appearances. The last quintile averaged 131 in year 1, and 113 in year 2. Josh Hamilton, John Kruk, Lonnie Smith, and Ryan Klesko all improved and had an OPS+ of better than 130. Four hitters had an OPS+ of less than 100. This group averaged 343 plate appearances. Another way to split these guys into groups would be by plate appearances. The top quintile averaged 639 plate appearances, with a 151 OPS+ in year 1, and a 137 OPS+ in year 2. The next group averaged 463 plate appearances, with a 141 OPS+ in year 1, and a 136 in year 2. The middle quintile averaged 388 PA, with a 138 in year 1, an 85 in year 2. The fourth group averaged 337 PA, with a 135 in year 1, a 122 in year 2. The last group averaged just 273 PA, with a 139 in year 1, a 116 in year 2. All in all, 20 of the 55 players did better than 130 in OPS+ in year 2, 25 did better than 120 OPS+, 33 did better than 110, and 48 did better than 100. That leaves seven true busts, and 30 total who could be considered disappointing. Eleven of the 20 players who topped 130 in OPS+ had more than 450 plate appearances. Only four of the next 20 players had 450 PA or more. A final set of ranks, based on percentage of change from year 1 to year 2. 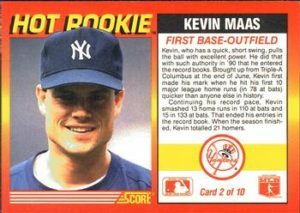 The top quintile averaged 428 plate appearances, posting a 138 OPS+ in year 1, and a 154 in year 2. The next averaged 508 PA, with 142 in year 1, 131 in year 2. The middle quintile averaged 415 PA, with a 141 OPS+ in year 1, a 116 in year 2. The fourth quintile averaged 352 PA, with a 137 OPS+ in year 1, and a 103 in year 2. The bottom quintile averaged 388 PA, with a 153 OPS+ in year 1, and an 85 in year 2. Comparing the top half sorted by percentage of change from year 1 to year 2, the top half had 487 plate appearances while the bottom half had 384. The average age of the top half was 23.4 years old, while the bottom half was 24.5. Perhaps not surprisingly, the bottom half hit more homers and stole more bases per plate appearance. Plate appearances and high OPS+ are the best indicators of a repeat season of top performances for these players, but players of all types do repeat and get better. So, what happens if we look at only those players with fewer than 450 PA in year 1? There are 37 of them. Sort them into thirds, and we see that the top two thirds are younger than the bottom third. Older is definitely worse when you’re looking at partial seasons with a high OPS+ in your rookie year. Or maybe it is better put, younger is definitely better. So, what do we make of this year’s crop? Corey Seager and Aledmys Diaz should be the most trusted, because they had the most at bats, but neither had a particularly high OPS+ last year, which is a bit of a warning sign. And Diaz is somewhat older, a reason to distrust. Trea Turner had the best OPS+ last year, but only 324 plate appearances. Still he’s young, which is a positive sign. Ryan Shrimpf just snuck onto the list at 130 OPS+. He’s 28 years old, very old, and only had six more PA than Turner. He’s neg all the way. Finally, Ryon Healy is slightly old, with a 135 OPS+, and only 283 PA. Not as negative as Shrimpf, but not as positive as the other guys. Bonus No. 1: Kyle Schwarber missed last year, but will be back this year after a powerful world series. He’s still young, but is coming off a 130 OPS+ in 2015. He’s a mixed bag until you see him swing. Bonus No. 2: Gary Sanchez didn’t make the 250 PA cutoff, but in 229 PA last year he put up a monster 168 OPS+. Only Mike Trout and Jose Abreu did better in our 250+ PA cohort. On the other hand, if you look at the cohort of those who didn’t qualify, the only hitters who did better in year 1 were Frank Thomas and Phil Plantier. Both were 22 their rookie year. Thomas followed up his 177 OPS+ rookie year with a league leading 180 the next year, and then 177, 174, 212, 179, 178, 181 in the next six years. Plantier followed his 178 with a 90 and never topped the 122 he had in year 3. Finally, what to do with all this? Although there is data here, this sort of study is really anecdotal. The sample is small, the results so various as to mock any absolute conclusions. But maybe you read the above and feel differently. What I think it tells us is that there are players who post a super first season and then repeat. You can’t rule that out for these guys this season. But as you would expect, extreme performance usually regresses to the mean, so you should not count on a repeat. And you should fear charging ahead taking anyone with such a small performance sample, because the possibility of sophomore slump is always there (except for Corey Seager, right?). The trouble with Turner is that even if you regress back his stats you end up with ridiculous numbers. My projection, which doesn’t come close to doubling last year’s numbers is 18 homers, with 49 steals, a modest 93 runs and 68 RBI, with a .307 batting average. In 5×5, that’s worth $37. First-round value. ZIPS chops more aggressively. It gives Turner 260 more plate appearances than last year and one more homer, three more steals, a .282 batting average and modest 77/66 runs and RBI split. But even that modest projection is worth $29, which is a Top 15 hitter. Is my projection the median projection? Is ZIPS’? That’s the trouble with Turner. Right now I have him with an NL-only bid price of $27. That’s not going to get him, and paying more isn’t necessarily going to hurt the team that buys him. So, what you do is you keep bidding. Certainly to $27, maybe to $30. This is a place to read the room. Once you’re at $30 you don’t really want him, but the risk of bidding up the guy who does really want him isn’t huge. I mean, you might end up with Trea Turner! At that price, that could be trouble, but might not. Here’s a link to the data, both that which I used and that which I didn’t.